I’m not even sure where to begin about this dish, WE LOVE IT! It’s warm, spicy, comforting, and super delicious. I first had this dish in Playa de Carmen, Mexico this last November, and I’ve been making a version of it ever since. That’s what’s awesome about traveling and trying the traditional dishes, you can bring home a piece of that experience. Chilaquiles is a traditional Mexican dish, typically corn tortillas cut into quarters and fried are the basis of the dish and a green or red salsa is usually poured over the tortillas until they begin to soften. Either eggs or pulled chicken are sometimes mixed in. The dish is topped with cheese and sour cream and maybe served with refried beans. It’s usually eaten for breakfast or brunch, this makes it a popular recipe to use leftover tortillas and salsa. They also believe this dish is a cure for a hangover… you decide. I will share the way I interpreted the dish but try and make it your own. We thought this dish was special enough for Christmas Eve breakfast with my mom and Big Mike, it was a total hit. Also my friend Nicole asked me for some Indian cooking tips, and I told her I would post a list of Indian spice that I think would possibly work with this dish. Enjoy! 2. Pre-heat oven to 350 and line a cookie sheet with foil, take to tortillas and cut in half, and then in half again. You’ll have 4 quarters then cut each of those in half and place on cookie sheet. Drizzle with a little olive oil and when oven is ready place in oven and bake for 10-15 minutes. You want them crispy and slightly browned. When done take out of oven and let cook. 3. Next get two bowl ready for serving. Place a frying on medium heat with a little olive oil crack all the eggs and begin to cook, be sure to season with salt and pepper. Cook them to your liking, we like them over easy. 4. Just before the eggs are cooked add the half moon slices of onion into the tomato chipotle mixture and stir in. Then warm then through just a little, when ready spoon about 1/2 c to 2/3 of a cup of the tomato onion mixtuer into each bowl, next top with the eggs. Here’s a few Indian spices I think would work if you want to take the dish that direction. I would start with about 1/4 t. of some of these to start out, remember you can always add more. P.S. We had this dish for brunch this morning, and maybe for dinner later in the week :), also I use the leftover sauce for another dish that I will share, Brown Rice and Eggs. 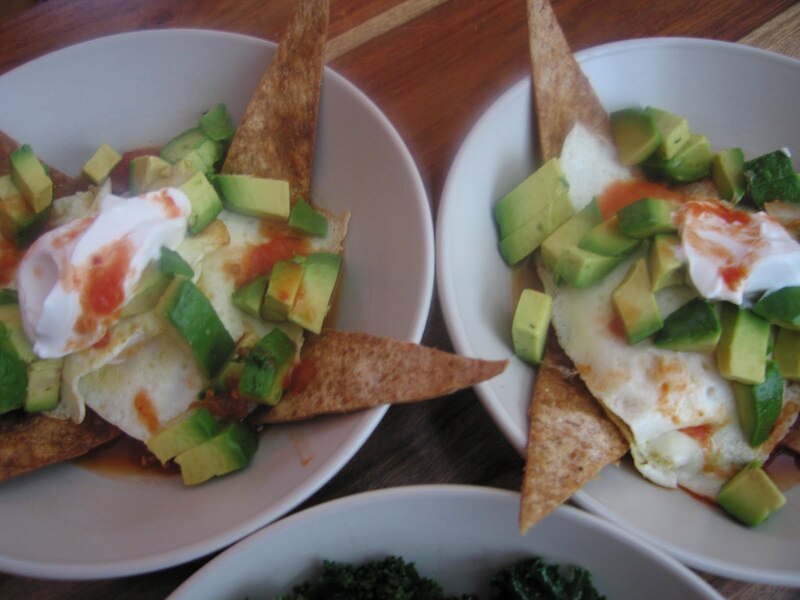 How funny – I made chilaquiles for dinner last night! It's one of my favorite dishes. My neighbor who's Mexican makes a breakfast version that I'm lucky enough to get some of!! That's awesome, I had it for dinner last night! It's a dish that is good any time of the day. Hey Gwen, as soon as the weather get's good I'm sure we'll see you in the neighborhood. I miss you and Larry, and of course HoneyBear! Yes please call me about the book club. I am burning the candle at both ends right now, but what one more thing?! School is great, I'm finally at the half way mark, YEAH! I just said to Bill this morning that before we know it it will be Market time again, I can't wait. Tanjie, I'm honored that your blog stalking me! Thank you for trying something new and making my recipes. I hope to continue inspiring you and Travis to cook and try new things. I have some family friendly recipes that are fun, creative and good for your insides. Good luck and keep cooking. Thanx for your comment.